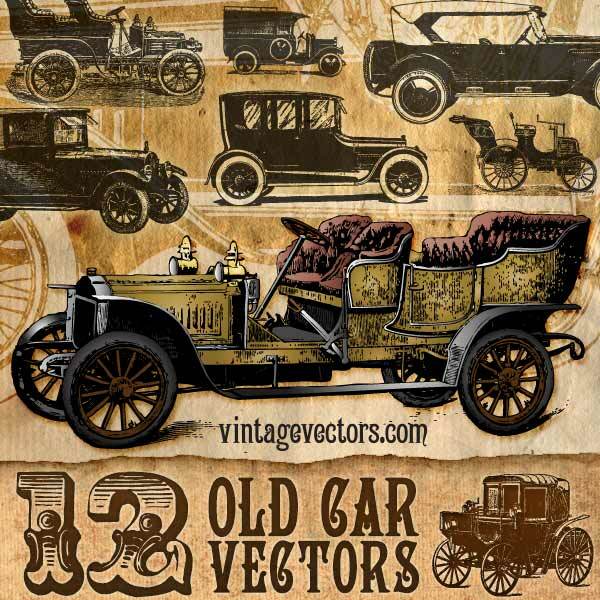 Years ago I vectorized these antique car illustrations for keepdesigning.com. Now I’m making them available as a free download here at VintageVectors. There are 12 antique car vectors in all – motorized coaches, prohibition age gangster cars, and a Gatsby period luxury car which is Adobe Live Paint ready. Use the Live Paint tool to easily change the car’s colors, interiors and exteriors. Nostalgic cars, vintage cars, retro cars, all highly detailed and free for both personal and commercial scrapbook and graphic design works. Click here to see a big ol’ jpeg of all 12. Oh, cool! Those were pieces of art, compared to autos now. LOL Thank you!